One serving of Himalaya Herbal Ashwagandha recorded 670 mg of ashwagandha root extract containing 2.96 mg of withanolides (0.0044%). Overall, Himalaya Herbal Ashwagandha scores a 4.5 out of 5, its a good product and has all the elements an ashwagandha supplement should save. The only real issue with this product is that its overall effectiveness in one serving might be to weak when compared to other more effectively dosed products. This product passes our ingredient review and scored a five out of five. No filler ingredients, nothing in its caplets that should not be there. Made in a way to just contain ashwagandha. Does not contain gelatin or any animal ingredients. Organic ashwagandha when available. Overall this product does a good job supplying quality ingredients without any fillers or additives. Current studies on ashwagandha show that a product containing root powder should have at least 0.3% withanolides and 1.5% withanolides for ashwagandha extracts. A key compound that may play a role in the herb’s activity. Typically 10 mg to 30 mg of withanolides per serving. One serving of this product recorded 670 mg of ashwagandha containing 2.96 mg of withanolides, a less than 1% concentration (0.0044%). 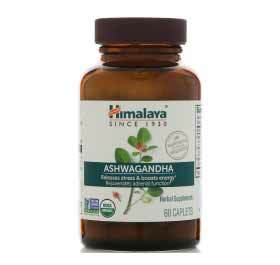 Himalaya Herbal Ashwagandha scored a 5 out of 5 in our quality review. No filler ingredients, no additives, just ashwagandha. Comes in a glass container, has certifications for USDA organic, vegan friendly, no dairy, no soy, and cGMP. Brand has been around for a long time, can be found in many retail stores, not a fly by night supplement company.